Home > Beaded Curtains & Columns > Shop by Bead Style > Champagne Bubbles (28) > CLEARANCE! 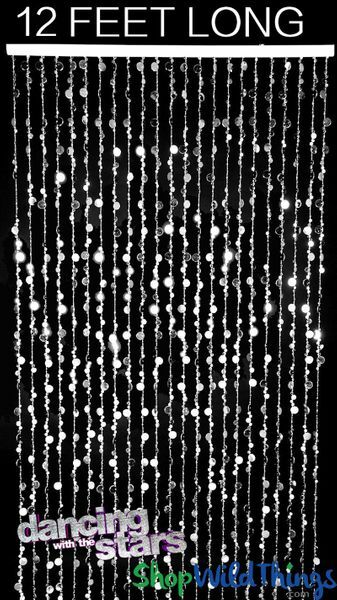 Bubbles Beaded Curtain Silver - 3ft x 12ft with BLING ROD! Our 35" wide by 12' long Bubbles Silver Beaded Curtain is easily one of our most popular selections at ShopWildThings and this one is already blinged out to the max! We added our Sparkly Bling Diamond Wrap to the header rod so from top to bottom, this curtain is opulent and dazzling! The main photo shows a plain rod but the 2nd photo shows the rod on this particular curtain. Take a moment to check out the video to see this sparkly curtain in action. 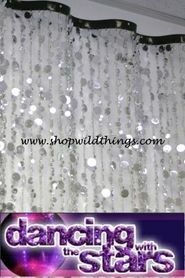 This curtain has been purchased from us to decorate the sets of Dancing With The Stars. We've provided this curtain to Warner Brothers, MTV, Vh1, Jimmy Kimmel, for the movie Dreamgirls and more! 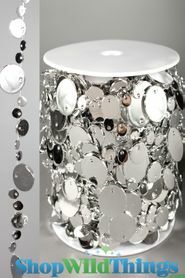 Our Bright Silver Bead Curtain hangs on one 35" wide rod and it's ready to hang right out of the box. 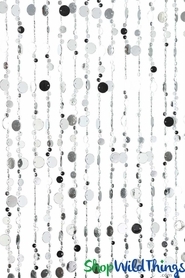 This curtain features Silver-Coated Bubble Beads. It's very bright and shiny! These acrylic bubble beads are so beautiful...they add sparkle and glitter all over any surface! You can even hang them on top of another fabric like a shower curtain or window treatment if you want the sparkly look but you still like a more little privacy! Our wonderful heavy-duty acrylic beaded curtains are a perfect addition to any room and can easily be used in place of regular doors, closet doors or mount behind a bed to add height to any room and it's absolutely the perfect backdrop for a head table, photo shoot or to create a focal point in retail shops! Because the bubble disc beads on this style lay in different directions, even with just 23 strands you get a very full look with this beaded curtain.